1352) What was Jesus Doing in those Thirty Silent Years? It is striking how little we know about most of Jesus’s life on earth. Between the events surrounding his celebrated birth and the beginning of his public ministry when he was “about thirty years of age” (Luke 3:23), very few details have survived. Given the influence and impact of his life, humanly speaking, we might find it surprising that so little about his childhood, adolescence, and early adulthood is available — especially with the interest his followers, who worshiped him as God, took in his life. That is, unless, divinely speaking, this is precisely how God wanted it. After the birth story, the first Gospel tells us about the visit from magi, pagan astrologers from the east (Matthew 2:1–12), the family’s flight to Egypt for haven (Matthew 2:13–18), and their eventual return upon the death of Herod (Matthew 2:19–23). Matthew then jumps immediately to the fore-running ministry of John the Baptist, and Jesus as a full-grown adult — with nothing at all about the intervening thirty-plus years of childhood, adolescence, and early adulthood. How fascinating would it be to know what life was like for the boy Jesus? Did he plainly outpace his peers in learning? Did his sinlessness infuriate his siblings? How skilled was he as a worker? But it’s easy to digress into speculation and miss the powerful point of these important summary verses in Luke. God has something to teach us here in the precious few details. That he would send his own Son to live and mature and labor in relative obscurity for some three decades, before “going public” and gaining recognition as an influential teacher, has something to say to us about the dignity of ordinary human life and labor — and the sanctity of incremental growth into maturity. God could have sent a full-grown Christ. And from the beginning, he could have created a world of static existence without infants, children, awkward teens, middle-agers, and declining seniors — just a race of young, spry, “mature” adults. But God didn’t do it that way. And he doesn’t do it that way today. He designed us for dynamic existence, for stages and seasons of life, for growth and development in body and in soul, both toward others and toward God. The lion’s share of Jesus’s earthly life powerfully dignifies the everyday pains of maturity and growth common to humanity. Jesus is both “truly God and truly man.” Having a “true human body,” Jesus was born, he grew, he thirsted, he hungered, he wept, he slept, he sweated, he bled, and he died. All four Gospels unfold his three-year public ministry, and give nearly half their space to the final week of his life. But what was the God-man doing most of his earthly life? He was growing. What did he do for three decades between his celebrated birth and his unforgettable ministry? He walked the ordinary, unglamorous path of basic human growth and development. He grew. The man Jesus did not simply emerge from the wilderness preaching the kingdom. He learned to latch and crawl, to walk and talk. He scraped his knees. Perhaps he broke a finger or wrist. He fought off the common cold, suffered through sick days, and navigated his way in the awkwardness of adolescence. He learned social graces and worked as a common laborer in relative obscurity more than half his earthly life. But Jesus grew not only in body, but also in soul, and like every other human, in wisdom and knowledge. 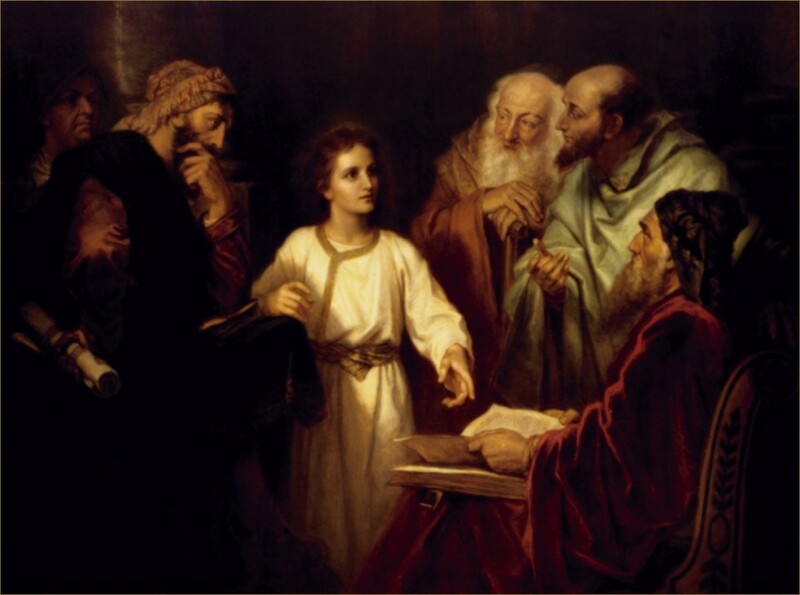 Even by age 12, Luke could say Jesus was “filled with wisdom” (Luke 2:40), not because he got it all at once, or always had it, but because he was learning. Through sustained effort and hard work, he came into mental acumen and emotional intelligence that he did not possess as a child. And he didn’t receive it all in one moment, but he grew in wisdom, through the painful steps of regular progress. His human mind and heart developed. He grew mentally and emotionally, just as he grew physically. Surely, we find extraordinary instances later in his life of supernatural knowledge, given by the Spirit, in the context of ministry. He knew Nathanael before he met him (John 1:47), that the Samaritan woman had five husbands (John 4:18), and that Lazarus had died (John 11:14). But we shouldn’t confuse such supernatural knowledge, given by special revelation, with the hard-earned, infinite learning of his upbringing. Jesus learned from the Scriptures and from Mary and Joseph, in community and in the power of the Holy Spirit, and he increased in wisdom by carefully observing everyday life and how to navigate God’s world. That he “learned obedience” does not mean that he began as disobedient, but that he began as unlearned and inexperienced, and the dynamic existence of human life gave him experience and know-how. That he was “made perfect” doesn’t mean that he began as sinful, but that he began in sinless immaturity and grew into maturity. No human, not even the God-man himself, skips the growth and maturation process. Don’t begrudge God the glory of your long, arduous maturation process. In it you are tasting the growing pains that Jesus knows very well. And he stands ready to help you persevere until God’s process is complete.